Tedesco's Gizzie Memorials understands the importance of memorialization. Memorials and monuments tell who we are and where we come from, so finding the right one is exceptionally important. We offer a wide selection of monuments in various styles and materials so you can find the best one for your loved one. 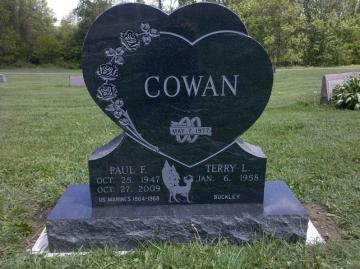 We strongly encourage your suggestions in helping with the design of your personalized monument or marker. We will provide you with a sketch of your monument to approve. We also offer a wide variety of granite colors to choose from. Visit our indoor showroom with more than 50 monuments in stock. We have hundreds more to choose from in our many catalogues. We service EVERY cemetery in this area. Many cemeteries have specific restrictions on the monuments allowed. Please read and understand the guidelines before purchasing yours. Monuments can be created in a wide range of styles, colors and materials. Tedesco's Gizzie Memorials wants to help you find the right monument to express the achievements of a lifetime. We offer single monuments, companion monuments, child monuments and veteran monuments in various designs. Single Monument - Single monuments mark a single plot. They can be found in a variety of shapes, sizes and colors. At Tedesco's Gizzie Memorials, we help personalize your monument to commemorate your loved one's life. Child Monument - Tedesco's Gizzie Memorials is so sorry for the loss of your child. We want to help bring comfort to your family by offering monuments that are tailored for your beloved child. Tedesco's Gizzie Memorials can help you decide what monument material best suits your needs. Many different types of materials are used to make monuments. Today, granite and bronze are the most commonly used materials.